Scientific American, November 14, 1903, cover. In the intense competition between newspapers, larger presses provided a competitive edge. 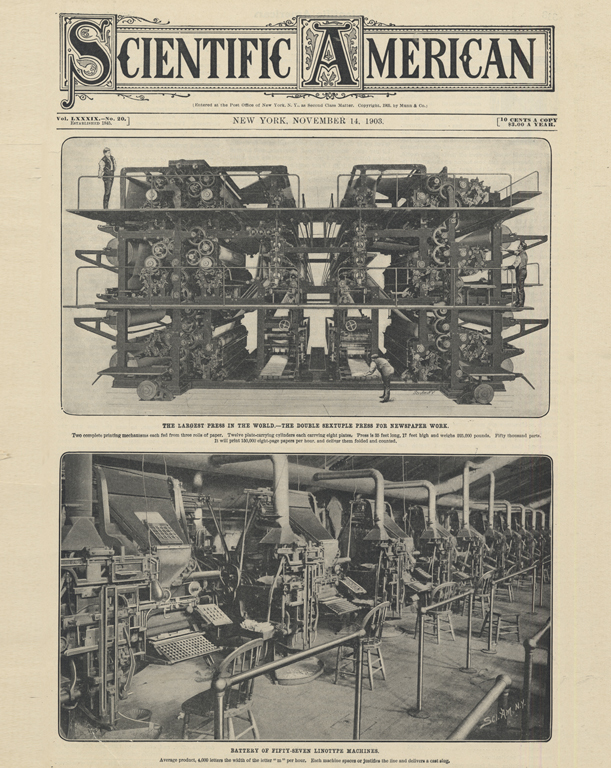 Increased capacity and the ability to print in color allowed publishers to sell newspapers with more pages, print extra editions, and include colorful supplements. For example, the Sunday World, which cost a nickel in the 1860s for a four-page paper, by the 1890s sold a 48-page edition for the same price. Gigantic presses like the 1903 Hoe Double Sextuple made these increases possible. The largest press in the world at the time, the double sextuple was 35 feet long, 17 feet high, and weighed 225,000 pounds. Printing from three rolls of paper, the double sextuple press had twelve cylinders that each carried eight plates. When running at full capacity, it could print 150,000 eight-page, or 50,000 twenty-four-page, papers an hour. The speed of the new presses meant that typesetting machines multiplied to meet the pressures of competition. A linotype operator could produce 4,000 letters an hour, which was four times faster than hand composing; expert linotype operators could produce up to 8,000 letters an hour. The most successful newspapers needed large batteries of machines. The World installed one hundred typographs in its new building in 1890, for example, and added 64 Linotype machines upon completion of its Annex. NEXT: A TOWER TO "WAKE UP THE NATION"